Atlas and the Anchor: The Rural Alberta Advantage - "Hometowns"
The songs that comprise Hometowns by The Rural Alberta Advantage are singer/songwriter Nils Edenloff’s way of coping with the homesickness and loneliness following a move from his hometown. Heartfelt and energetic, the descriptive songs act as aural postcards. The opening song, “The Ballad of The RAA” is slow burning with a steady beat underneath the well orchestrated flourishes and pining vocals. “Rush Apart” adds in Paul Banwatt’s clattering, front and center percussion work that gives the songs a percussion-driven sound similar to The Dodos. 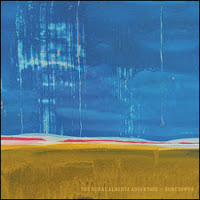 The frantic “The Dethbridge in Lethbridge” is a standout with more raucous drumming and strumming with howling vocals and Amy Cole’s contrasting, calming background vocals. “Don’t Haunt This Place” combines the two voices and cinematic cello with a techno-like, quick-paced beat with beautiful results. “Drain The Blood” is gritty but gorgeous at the same time, starting out at half-speed before kicking up the dust with a rumbling drum beat all while anchored to a catchy vocal melody. “Frank, AB” recalls the icy wind of the Great White North with its insistent beat and sweeping vocal harmonies. The wistful “Sleep All Day” is keyboard-led and like its title, never really shakes from its dreamy slumber as a nice change of pace from the wild energy of the rest of the album. The upbeat “Edmonton” is a poppy ode to his old hometown. And “In The Summertime” closes out the album on an introspective note with droning keyboards that, just like Summer, ends before you are ready. After self-releasing the album last year and piling up the praise from bloggers as well as being featured on Emusic.com, Saddle Creek Records signed the band to give Hometowns a proper release on July 7th.